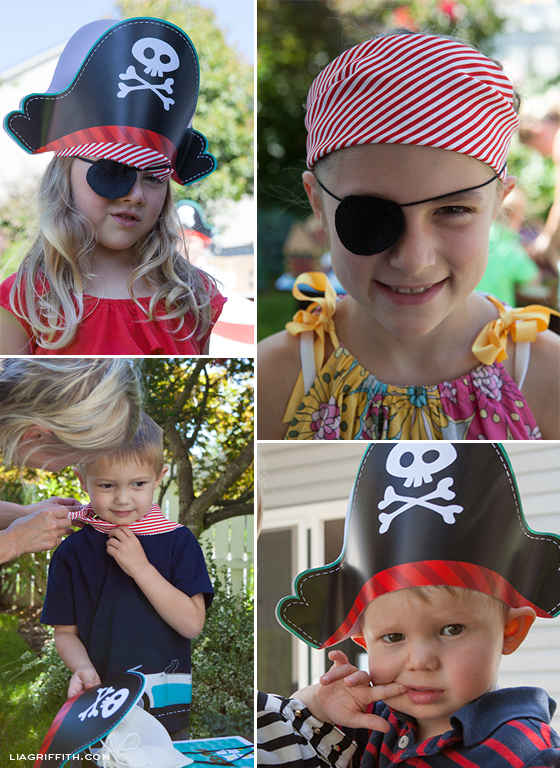 See image below for the description of the full kit to create your own Kid’s Pirate Party! I am trying to download but nothing happens! Can you help? 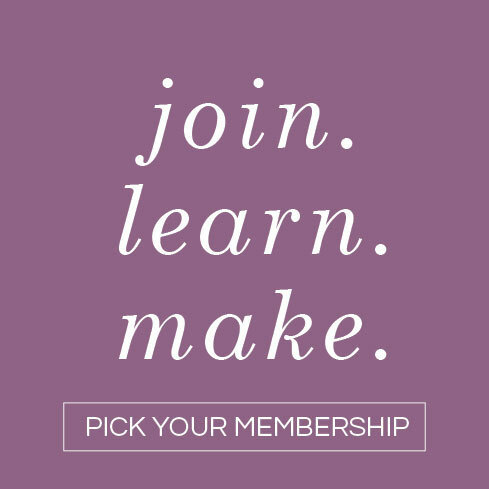 Can you email us more details at hello@liagriffith.com? When I download the banner, the first letter, “Y” is red and the rest is in green/blue. Is there anyway to get it all the same color? Seems like it would look very strange with the first letter a different color than the rest of the banner. Hi Andrea, something must be happening when you download the PDF– the entire banner is red (I just checked my files to be sure). You may want to try a different web browser, and be sure you’re downloading to your desktop (not just viewing the PDF in your browser). Hi Katie! I made a stencil from the design used on the pirate hat (just cut out the shape, place on top of the muslin bag, paint with red!) The bandana is just a square piece of striped fabric, edges cut with pinking shears, and folded in half to form a triangle. I was trying to find the “PIRATE SCARF & EYE PATCH” but couldn’t find it. 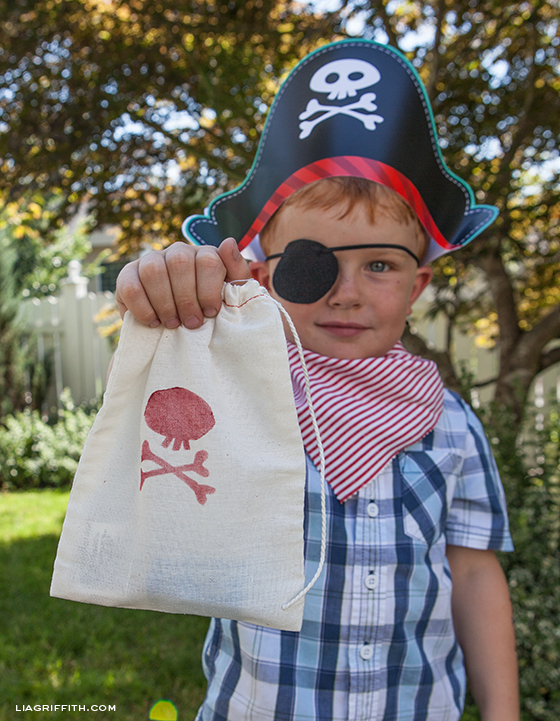 How did you attach the elastic to the eye patch, tacky glue? And for the striped fabric did you cut it as a square or triangle? No, I poked two small holes through the top of the patch and strung the elastic through. The fabric was a square folded in half, but cut into a triangle would work just as well. 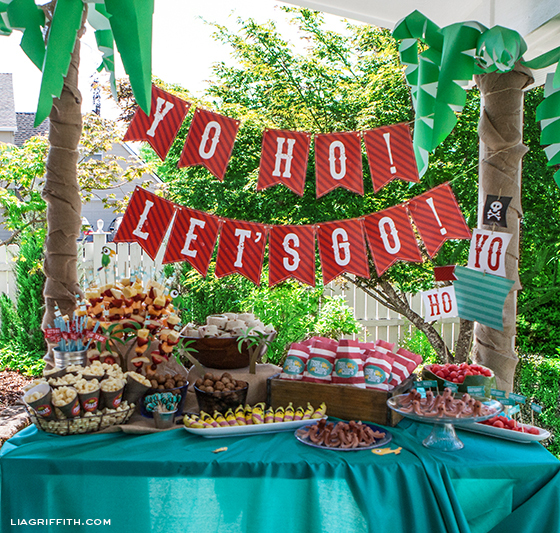 Hi, beautiful party! 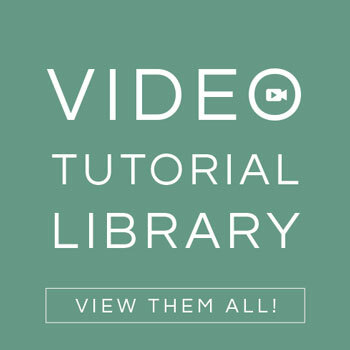 I was looking for the palm tree tutorial but couldn’t find it. I used label paper for these and carefully applied them to the boxes when they were still flat. You can use regular paper and glue if you like but may not get a smooth finish. 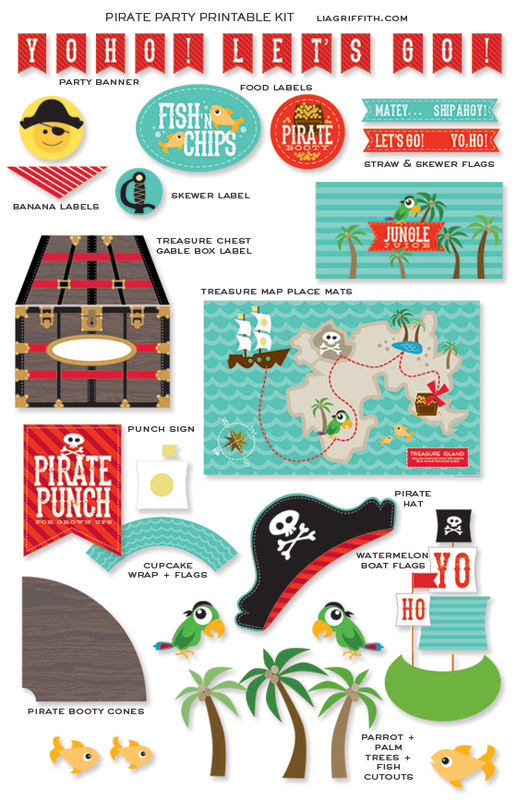 I TOO AM VERY KEEN TO PURCHASE YOUR PRINTABLES FOR A PIRATE PARTY. THEY LOOK AMAZING. DO YOU HAVE ANY UPDATES FROM ETSY? I’M IN AUSTRALIA. 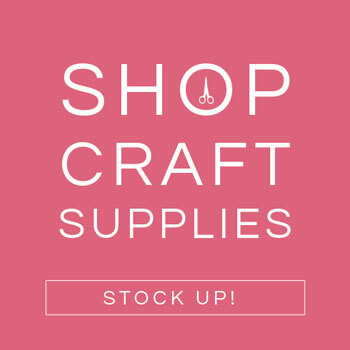 IS THERE ANY OTHER WAY THEY MIGHT BE ABLE TO BE PURCHASED ONLINE OR SENT VIA EMAIL? I’ve been trying to find you on Etsy but can’t seem to have any luck. When I try to go directly from here, it says -not available or something. 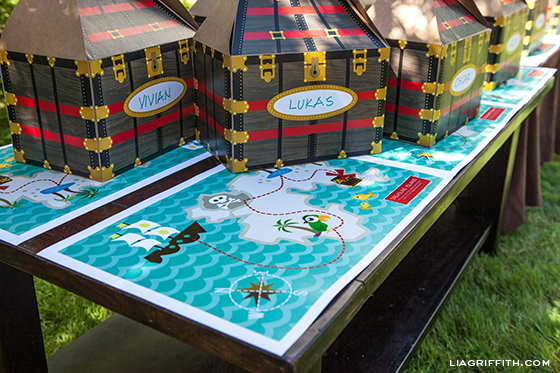 Can you please let me know how to get to you, I’m interested in Pirate party package, thanks. Hi Veronica, calling Etsy right now. 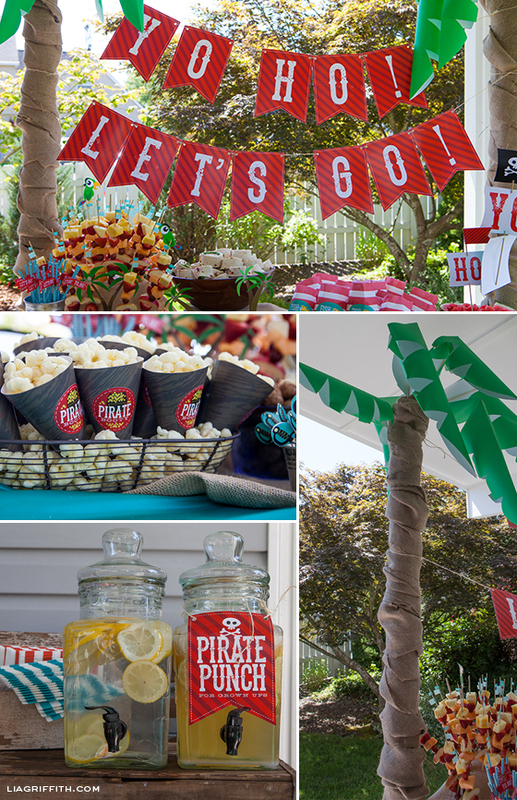 Hope you have a great Pirate party! Wow, that party turned out amazing! 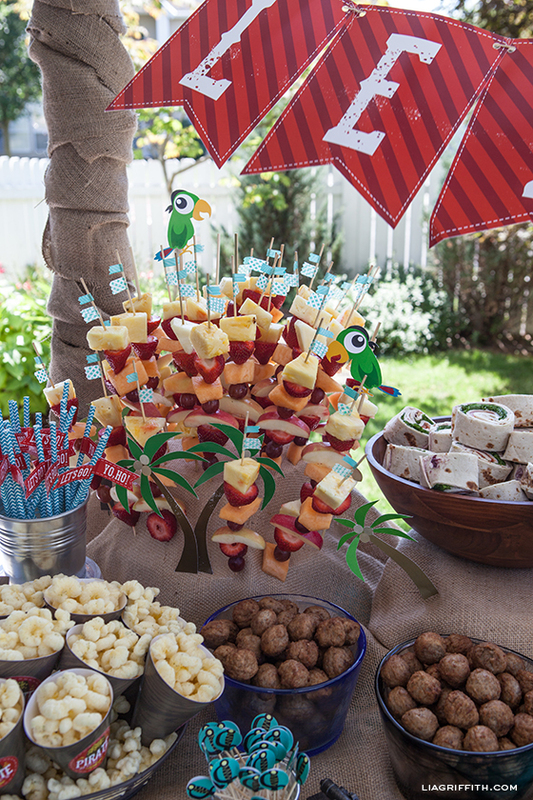 I could not find the palm tree cut out tutorial though and look forward to using the kabob holder as an idea for my son’s first birthday. Do you have the link? Also, is that styrofoam underneath the burlap? It is beautifully made, I hope I can recreate! I don’t have a palm tree tutorial up yet. I did have a foam ball at the top of the tube for the leaves to poke into. The palm leaves are just hand cut. I love all of your ideas! 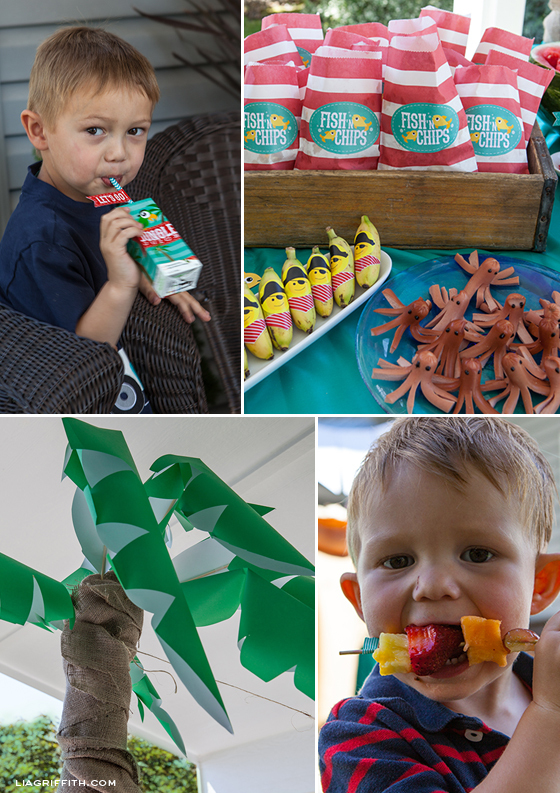 Have you posted the palm tree tutorial yet? It looks like maybe you used burlap? I would really like to have the details! Thank you! I have not and need to get to it!! I used a carpet tube with a foam ball on top. Wrapped it all with burlap strips, hot gluing as I went. I then cut large leaves from green paper while folded lengthways and glued bamboo skewers on the inside spine with the point sticking out a few inched. I then stuck the skewer into the foam to create the top of the tree. 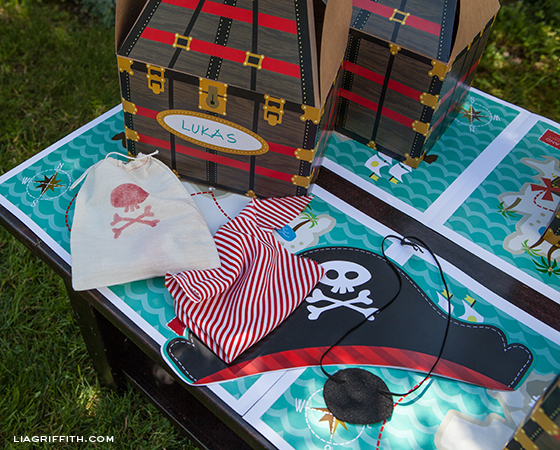 I am in love with the Palm Tree and the Kids Table Pirate Sail! Unless I am lacking sleep, I am not finding the tutorial for the Palm Tree or Table Sail. Could you direct me in the right direction? I have not posted either of those so it isn’t you. . . it’s me. 😉 When is your party? I seem to have some requests for that palm tree and was thinking to get it posted pronto. Where did you print everything out? Before I bought my Xerox laser printer for the business, I would use FedEx Office or other office supply stores that offer laser printing. The price for color ranges from 60¢ to $1 each depending on the size. Where did you purchase the striped bags. I listed all the sources at the end of the post. Hi Lacey! I found these bags at a local craft store, but you can find them on Amazon. The link is in the text at the end of the post. I printed the hats at FedEx office on an 11×17 card stock. 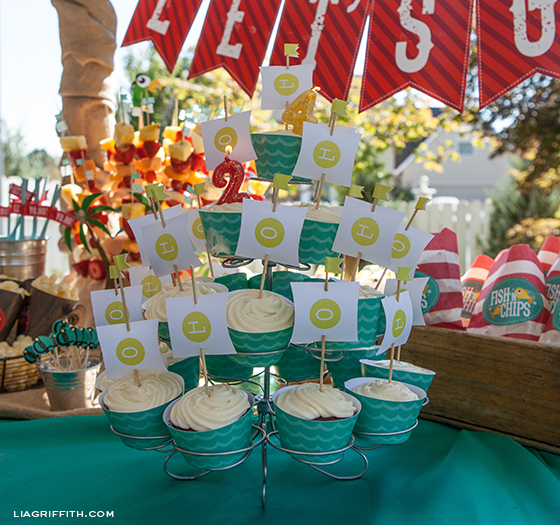 The hat designs are available in my printable kit for this party. 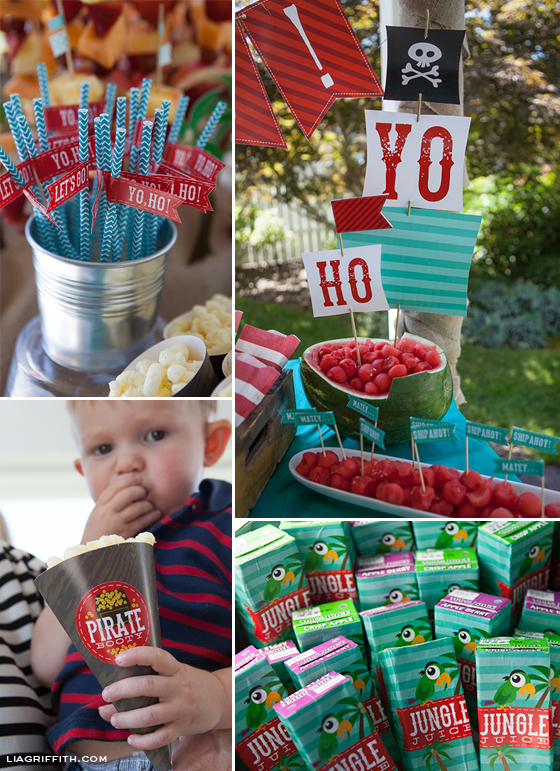 I can’t seem to find the pirate printable on Etsy and would love to purchase for my son’s upcoming party. Is there another way to get it? Thanks Lia! Liv is going to think she’s famous. 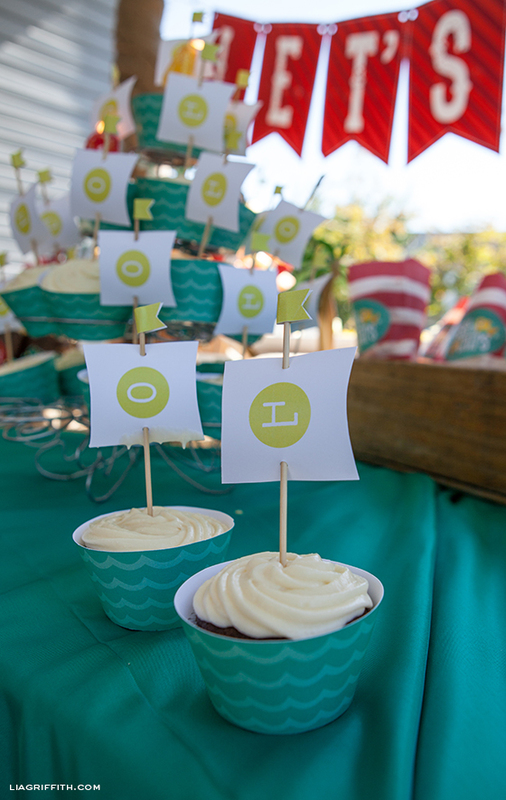 It was an amazing party! She is! 😉 Thanks Lois, I had a great time doing it. This is AWESOME! 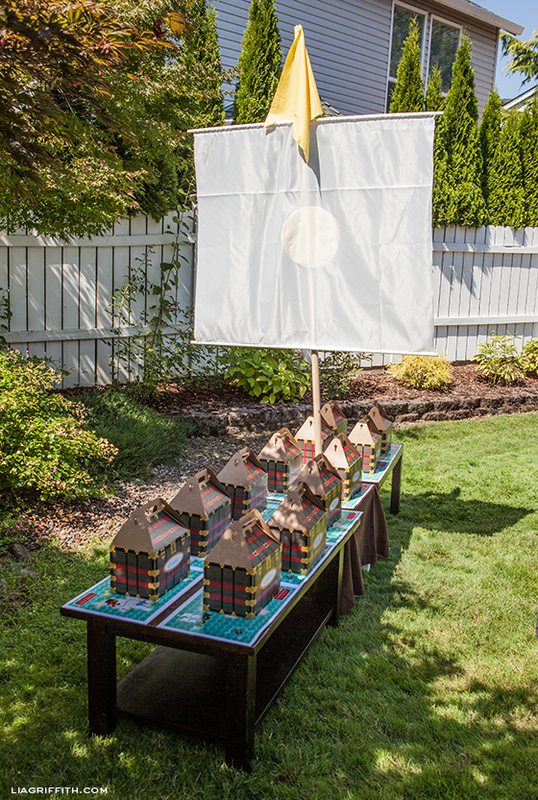 I’m sure any child would love this for his/her birthday! Thanks Lisa! I think I want it for MY birthday too. haha.